ABC of Learning and Teaching in Medicine is an invaluable resource for both novice and experienced medical teachers. It emphasises the teacher’s role as a facilitator of learning rather than a transmitter of knowledge, and is designed to be practical and accessible not only to those new to the profession, but also to those who wish to keep abreast of developments in medical education. Fully updated and revised, this new edition continues to provide an accessible account of the most important domains of medical education including educational design, assessment, feedback and evaluation. The succinct chapters contained in this ABC are designed to help new teachers learn to teach and for experienced teachers to become even better than they are. Four new chapters have been added covering topics such as social media; quality assurance of assessments; mindfulness and learner supervision. 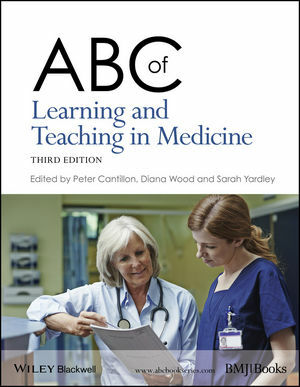 Written by an expert editorial team with an international selection of authoritative contributors, this edition of ABC of Learning and Teaching in Medicine is an excellent introductory text for doctors and other health professionals starting out in their careers, as well as being an important reference for experienced educators.